Why We Want a Sponsor ? We have a dedicated team of committee members who put a lot of time and effort into running and maintaining the band. Without the dedication and support of these individuals the band could not function nearly so well as it does. Over recent years progress has been made in numerous areas including equipping the band with new instruments (thanks to a lottery grant), mutes, new music stands and more recently a decent set of uniform jackets. Although every effort is made to balance the books by performing a number of concerts throughout the year, the expenditure involved in running the band, often makes it necessary to increase ticket prices or cut down on the number of things the band would like to do in a year. More often than not it also means increasing hefty subscriptions costs for members. Sponsorship is therefore greatly appreciated but sadly unforthcoming for many bands. Cranbrook are no different in this regard and are looking for sponsorship in order to help ensure the continuing improvement of facilities, music library and ultimately musical performances. Sponsorship of a brass band can be a source of cheap and highly effective advertising. 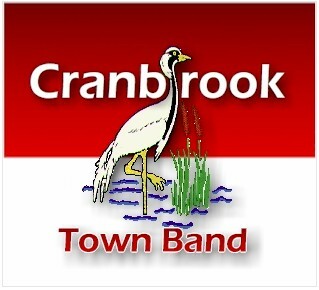 By sponsoring Cranbrook Town Band, your organisation would receive constant advertising and recognition through performances made by the band throughout Kent and Sussex. With a usual concert schedule consisting of at least a dozen (and sometimes many more) well publicised concerts throughout the year, your business has the potential to reach a wider audience than ever before. It may come as some surprise but Brass Bands are popular the world over and with our web site now being seen by people from all over the world (30 Countries in the last year alone), our web site could also offer you a chance to promote yourself to audiences previously unreachable. If you have any interest in sponsoring the band, or if you would simply like some more information on our organisation please contact the Chairman at the address below.